Capitalmind Premium is a lot of things! We bring you brilliant in-depth analysis of stocks, fixed income and macro about India. See all our posts linked below, our portfolios, our open source tools, our videos and webinars, and a bunch of tutorials you will like! If you’re a member of Capitalmind Premium, you may need to login (or use the login box on the right) to see these posts. Look at the table below for all past premium posts. There are more than 400 posts, so you might take a while to peruse them. As a premium member we will send you mails regularly. You want to invest, and we’re here to help! Here’s a list of our portfolios that you can buy into. We all love short term momentum. So we build some cool tools and a set of portfolios that you might like! The Momentum Portfolio consists of 30 stocks that are selected using our new DIY Toolkit on Snap (See video) and Snap Outliers. Read about how this strategy came around. The idea is to have 30 stocks which will be only-long, and we replace them once a month. We will hedge when markets look weak, through the options markets. We regularly analyze stocks for long term opportunities. Stocks with an interesting story, a good valuation and a solid trigger for the future. And then we buy them in a portfolio format. With about 25 stocks in it at a time, this is a diversified portfolio focused on value. We do not recommend buying in one shot, but with regular investment each month. and do not keep target prices. This is a portfolio of stocks paying high dividends particularly aimed at income seeking investors. Imagine buying a portfolio that has long term stable stocks (not mega-growth) that are cash-generating and give great dividends. We have put a threshold yield of 4% which is close to the current savings bank account interest rate. This is a less volatile investment strategy, and we rebalance once a year. We also have an Electric Vehicles Portfolio. Based on the (very) long term bet that Electric Vehicles will succeed. The suggestion here is to invest a small amount every month, but that also we will add more (or remove) stocks every few months as news comes along. Buying back stocks is a common exercise in India, but there’s a way for a small investor to get a big advantage. We buy if there is an opportunity and then tender. A single buyback takes three to four months. We will only bother if there’s a 10% return, so that the “low risk” return on an annual basis will go to about 25%+. Who doesn’t like fixed income? Fixed deposits are the most popular product in India. Yet, we like the bond markets. And we have strategies to attack them. Our fixed income portfolio has tried to generate better returns by just choosing mutual funds that are attractive but that only invest in debt. Our latest post on this is: Go to the Ultra Short Term Funds now. You have a fixed amount of money to invest, and probably earn some every month. Here’s our “Do-it-Yourself” way to allocate your money to Stocks and Fixed Income. It tells you how to divide your money in our portfolios. If you only want to buy the Long Term Portfolio, here’s is the Capitalmind recommended approach to using the Long Term Portfolio. We have an amazing portfolio in 2016, the Monsoon Portfolio returned 20% in four months. We built it based on the expectation of a good monsoon, which happened, and the stocks did their job too. 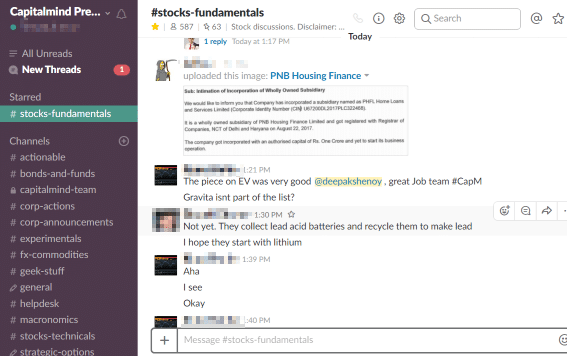 You will love our real time conversations on Capitalmind at Slack. Join now and if you haven’t yet done so, mail us at premium@capitalmind dot in. There are lots of brilliant conversations. We even have a searchable archive of the whole past conversations for you. We have an awesome platform for you at Capitalmind Snap! There’s so much out there you can use. Check out our proprietary Outliers, which is our algorithm that ranks stocks based on price momentum. We even have some cool charts! 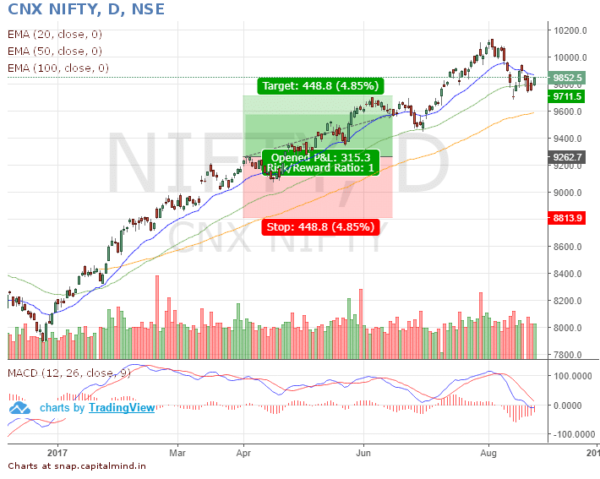 Check out our Stock Charts and then, the Futures and Options charts with data from the NSE. Also, check out the brilliant Open Source Options Analysis Toolkit, written for Google Scripts. You can use it to build payoff graphs and check out strategies online. If you’re a Windows user, you can also download an open source version of Options Oracle, a tool that allows to you build options strategies. And if you want to know about how to get instant alerts when a company you follow will release something to the stock exchanges, check out our Open Source Alerting Toolkit for Google Scripts. Building Long Term Bond Portfolios or your own Pension Fund.